As authorities struggle with the aftermath of a massive flood which killed over 170 in Russia’s south, conspiracy theories on the deluge’s nature are popping up all over the Internet, provoking heated debates and forcing officials to respond. ­The flood on July 7 killed over 170 and left nearly 500 wounded. The battle to find the missing and identify the dead continues in the Krasnodar Region, as July 9 has been declared a day of mourning for those who perished in the cataclysm. 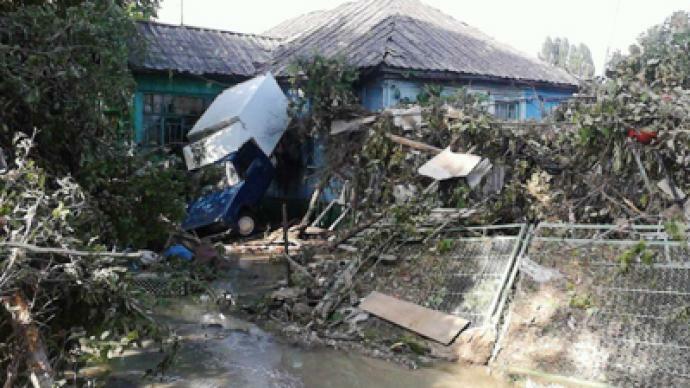 Local authorities have officially confirmed that heavy downpours have caused the floods that devastated 5,000 residential houses in the cities of Novorossiysk, Gelendzhik and Krymsk, leaving thousands of people roofless. The town of Krymsk was affected worst of all. According to the latest reports, almost 35,000 people have been affected by the tragedy. The governor of the Krasnodar region Aleksandr Tkachev has stressed that there have been neither massive water discharge from the local water reservoirs, nor were the dams damaged by the excessive rise of the water table. This information has been confirmed by inspections made from helicopters. Still, the head of the Russia’s Ministry of Emergency has acknowledged that the flood hazard alerting system did not function properly in Krymsk. But in the Russian blogosphere, an outpouring of opinions concerning the tragedy has created a tsunami of its own. ­From the very outset of the disaster, the Internet has been abuzz with chatter as to whether the floods in Novorossiysk, Gelendzhik and Krymsk were purely natural or partially man-made. These three cities are divided by small, but still considerable mountain ranges, and thus were affected by the flood waters in different manners. Novorossiysk and Gelendzhik are Black Sea port cities surrounded by mountains from three sides. The water that poured down their streets and out to sea were caused by unprecedented cloudbursts. Once the precipitation fell to the ground around these two cities, it drained into the sea from the surrounding mountains – eventually flushing through residential quarters, causing havoc and several deaths. But the situation in the epicenter of the tragedy – the small town of Krymsk – developed in a different manner. The town virtually went under water in a matter of 10-15 minutes, according to local witnesses. 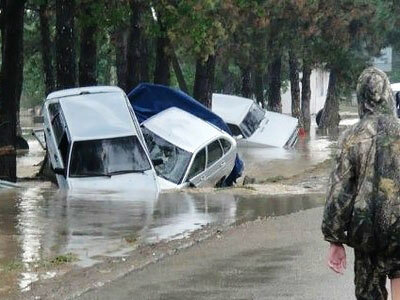 The local media even used the words “wave” and “tsunami” to describe the torrent of water that swept through the town. A tsunami of rumors quickly hit the Russian blogosphere, with many accusing the local authorities of being behind the devastating flood in Krymsk. Various internet activists lent their support to the conspiratorially minded, claiming the deluge was actually a technological disaster caused by the emergency evacuation of water from the local water storage basin. The bloggers maintain that the local authorities allegedly did it to avoid dam breaches and potential infrastructure damage in the region. Krymsk is situated in a vast valley surrounded by nearly 400 meter ranges. There are two water storage reservoirs in the area, the Varnavinsky reservoir and the Neberdzhaevsky reservoir. Neither suffered damages during the flooding, and their dams remained intact. A contour map of the Krymsk area suggests that the Varnavinsky reservoir is actually located on a lower level than Krymsk. It has an escape channel for emergency discharge which directs any outflowing water away from Krymsk. The Neberdzhaevsky reservoir, which is 18 kilometers from Krymsk, is filled by various rivers One such river is the Adagum, which flows through Krymsk and disembogues into the reservoir. The dam of this reservoir is also located on the opposite side of Krymsk. Moreover, the emergency discharge of the reservoir is of a glory-hole spillway design which excludes the discharge of any considerable quantity of water. The local authorities have reported that there was a discharge of water from the reservoirs, but whether they could have contributed to the flood in any considerable manner is a question that remains to be answered. However, the likelihood these reservoirs were in fact sources for the hundreds of thousands of tons of water that flooded Krymsk remains highly questionable on purely technical grounds. The basin, located deep in the mountains, may have secured the town from total immersion, it appears. 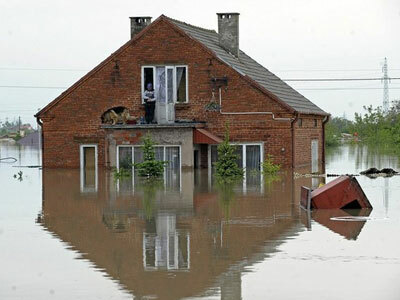 Waters levels in the reservoir jumped from 3 million to 8 million cubic meters overnight, so the storage worked as a “safety bag” for the city, securing it from an even worse flood, the Neberdzhaevsky press service says. Moreover, “Krymsk was flooded much earlier than the reservoir started draining excessive water,” the press service told RIA Novosti. On Sunday the Investigative Committee confirmed that it does not consider a water discharge from the Neberdzhaevsky reservoir as the primary cause of the deluge. “The investigation has found that the discharge of water was carried out in a normal fashion, the reservoir was not overflown… No mass discharge has been registered,” Investigative Committee spokesperson Vladimir Markin said. Local authorities insist that the true reason for the flood was the record level of precipitation in the region. No damage to the dam was discovered as an Emergency Ministry chief inspected it from a helicopter on Sunday. Later in the day, the region's governor took five local residents and a TV crew on a similar flight to prove to the public that the dam is intact and its design does not allow water drainage. “Upon returning, the initiative group has confirmed the governor’s words: the dam is undamaged, it is not over-flown and there are no gates there. So water draining was technically impossible,” says the governor’s official web site. The Adagum River that flows through Krymsk collects waters from several smaller rivers flowing from the surrounding mountains. The rains continued unabated for 24 hours. 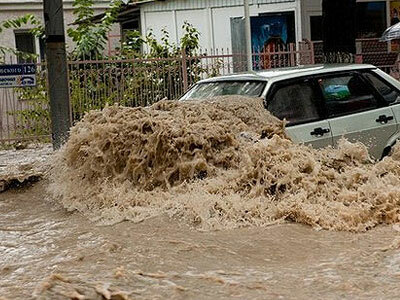 There was a report about 281 millimeter rainfall in Gelendzhik, 275 millimeter rainfall in Novorossiysk and 221 millimeter rainfall in Krymsk. All these figures exceed a month norm by four or five times. The difference in the degree of devastation may ultimately lie in their topography. The rain waters that flowed through Gelendzhik and Novorossiysk were collected from a relatively small areas limited by mountain ranges. The valley where Krymsk is located is much bigger. And all the water in this valley that fell from the sky was finally collected into several springs and rivers, all of which converged in the Adagum River that cuts Krymsk in half. The meteorological data suggests that on every single square kilometer around Krymsk, some 220,000 cubic meters of water fell in just one day. That massive quantity of water flowed into the Adagum River, overflowing its banks and flooding the town of Krymsk completely. The elevation change between the top of the surrounding range and the bottom of the valley near Krymsk is some 350 meters, which explains the high velocity of the millions of tons of water that rushed down to the bottom of the valley and into the Adagum River. What largely aggravated the tragedy was not only the geographical position of Krymsk, but the fact that the flood came late at night and most people were fast asleep, oblivious to the alarm system. In the end, whether the town’s residents were properly warned and why so many people were caught off guard in their beds has itself become a matter of criminal investigation.